Just when you thought you'd seen everything, someone tells you that there's green sand on the Big Island of Hawaii... We'll it's true. The sand here is actually green! 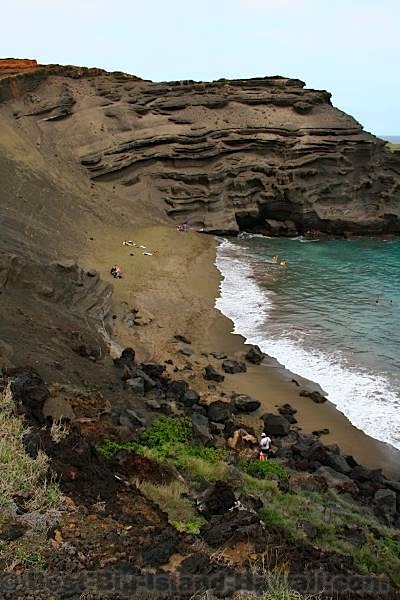 The color of the sand at this beach, located near the southern tip of Hawaii's Big Island, comes from a stone called olivine. Volcanic activity in this area created a cone containing large quantities of this mineral. As the power of the ocean takes apart the cone bit by bit, it crushes up the olivine deposits into fine green sand creating this amazing beach. 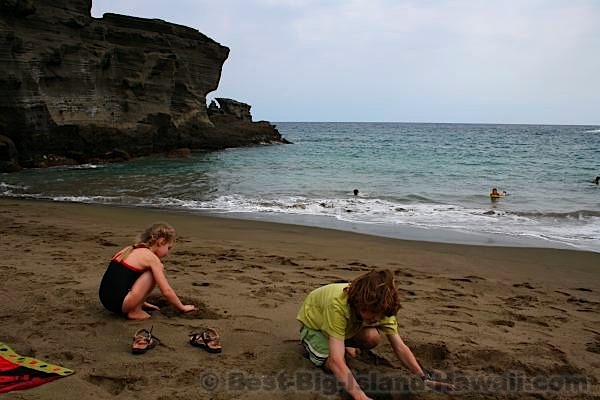 Green sand beach is actually a mixture of the olivine sand mixed with black sand, so it's not pure emerald green. But it looks quite green none the less. To get to Green Sand Beach, turn South off of Highway 11 between mile markers 69 and 70. The road is clearly marked with signs that say South Point. This road is off limits to most rental cars (though many people consider this more of a suggestion than a rule). Either way, the road is very drivable for just about any car. Just be aware of whether or not your rental company will bail you out if you get stuck for some reason. Some parts of the road are only passable by one car at a time, but there's plenty of room to pull off to the side. 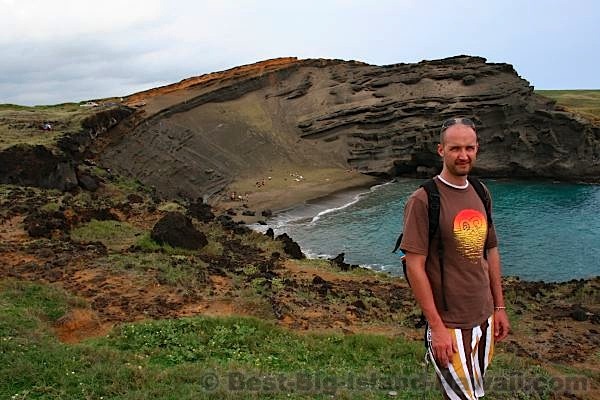 I would suggest visiting the area around South Point (also known as Ka Lae) in the same trip as Green Sand Beach. Plan for a full day in this area. South Point is not only the southernmost point on the Big Island, it's also the southern most point of the entire United States. As you drive South on South Point Road, the road will split. 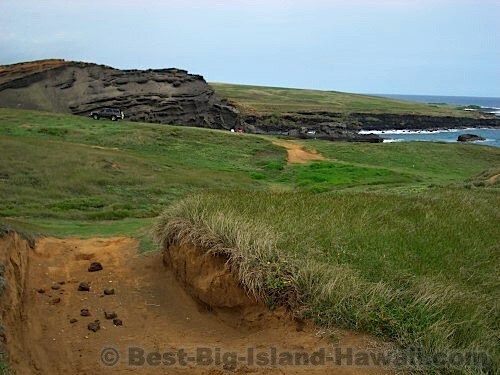 If you follow it to the right, you'll get to the boat hoist area with a beautiful view of the Pali (Cliffs) o Kulani, from which you can easily walk to the actual South Point. To get to Green Sand Beach, take a left at the fork instead. You'll drive about a half a mile or so before you come to a makeshift "Visitor's Center". This is not any kind of official center and I wouldn't bother stopping there. 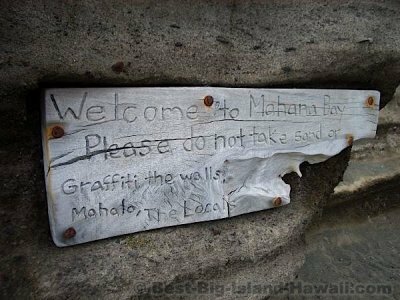 You might be pressured into paying to park (you don't have to) and you might feel unwelcome because of the signs suggesting that Hawaii belongs only to the local people and ought to be given back. 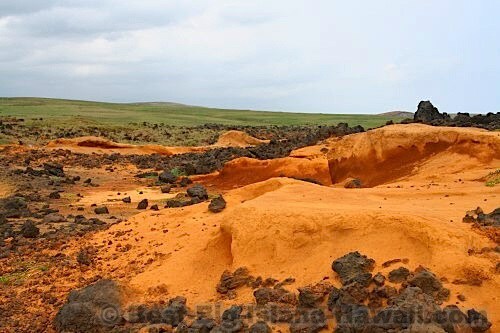 Access to South Point and Green Sand Beach is absolutely free; don't believe anyone who says different. In any case, just keep driving until you get to the end of the road. You'll see a gate to your left and probably some vehicles parked in this area. Unless you have a 4 Wheel Drive, this is where you need to park. From here it's just over two miles to the beach (but it sometimes feels longer). The walk is quite pretty though. You're up on the cliffs above the ocean in a beautiful green, hilly field. Just take your time and enjoy the quiet beauty all around you. Be sure to take plenty of water along, especially if it's a hot day. 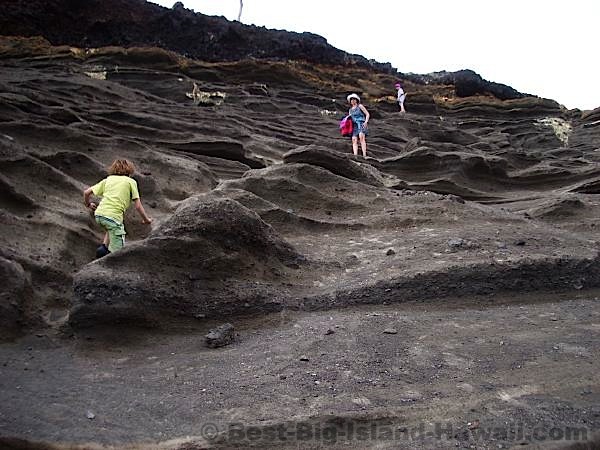 The dirt trails that lead to Green Sand Beach sometimes split off into many directions. You can't really go wrong here as all roads lead to green sand. Eventually, you'll come over a hill and you'll see the inlet of Green Sand Beach ahead of you. Keep walking until you get to the edge of the embankment. Rather than walking down at the nearest edge, continue around toward the back of the beach. It's easier to walk down from there. The path down isn't as obvious from the top as it is from the beach, but it's not as steep as it looks. Just be careful of your footing and take your time. Once you get to the beach itself, you'll spend the first little while marveling at the sand and then you can settle in for whatever you came here to do. Swimming is Ok here, but only when the surf is calm. In higher surf, stay out of the water. Actually, the whole beach can be washed in high surf conditions, in which case I'd stay of the beach altogether and check it out from above. Hopefully you'll have picked a day when the surf is not a problem and you can fully enjoy the beauty of Green Sand Beach. Because it's so out of the way, chances of a crowd are slim. Most likely it will be you and a few other peopple sharing this quiet spot. In calm conditions, currents are not really a problem in the bay. I wouldn't recommend swimming outside of the bay where the currents are much more severe. Ocean conditions are always a judgement call. When in doubt, stay out of the water. Make a green sand castle and enjoy yourself at this unique beach. But when you leave, only take with you the sand that gets stuck in your swimsuit. It may seem like the green sand is infinite, but it's not. It is disrespectful of this place to take sand with you. Enjoy it while you're there and take great pictures to remember it by. Accessibility: Out of the way. A long drive from civilization and a half hour walk unless you have a 4-Wheel Drive. Parking: Park at the gate and walk 2 1/4 miles, or leave your 4-Wheel Drive overlooking the beach. Swimming: Good in calm conditions. Dangerous in high surf. My Favorites Here: Being amazed at the green sand. Watch Out For: High surf and strong winds.